How many seeds are inside a pumpkin? That was the question that Mrs. Detter’s first grade students pondered during a recent math lesson. The students were split into small groups. Each group of students was given a pumpkin. The first task was to estimate by looking at the pumpkin how many seeds might be inside. The second task (with the help of parent volunteers) was to clean out the inside of the pumpkin and separate the seeds from the pulp. The third task was to count up the seeds using groups of five. The last task was to compare the number of actual seeds in the pumpkin to the estimate. 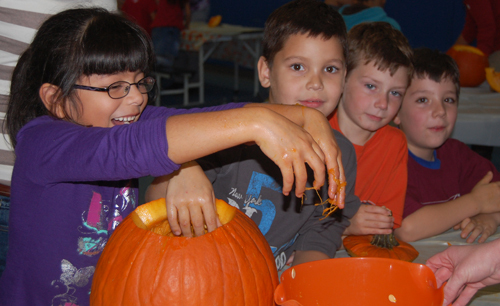 The students also read the book, How Many Seeds In a Pumpkin? by Margaret McNamara.